It’s my reply when people ask me how to become great in youth ministry. I’m guessing they ask me because I’m still in youth ministry. I suspect that they’re wanting to be on a similar path with similar results (not burnt out or in jail…that last part was a joke…sort of). But I think the better question is always do you love what you do? Do you think what you do has value and is significant enough for you to give your life to it? This is how I feel about youth ministry. It’s existence changed the trajectory of my life and my eternity. I never knew that spending the rest of my life saying “thank you” would also mean spending my adult life as a youth pastor. I wasn’t that intentional heading into youth ministry because I really didn’t know how. I knew that my youth pastor was awesome and that what he did was great but I always wondered how many people could actually do that, and survive? So, I went to college and majored in something because it’s good to major in something if you’re paying for something. I graduated with a big bucket type of ministry degree because I still wasn’t sold on the idea that there would be a church for me somewhere that would pay me to love people. But I sent my resume to a church leader who knew some other church leaders (while simultaneously applying at the Rain Forest Cafe and Victoria’s Secret) and waited. Just a few days after our college graduation I got a call from a tiny church in Orlando. They wanted to pay me $24,000 a year and I wanted to see if this youth ministry idea was for real. I said yes. Because I really thought that this was it. The church that would pay me to love people. It was the toughest year of my life. I relied on a youth ministry magazine for survival. I lost people’s children in amusement parks. I didn’t know how to communicate with my boss. I was afraid that I would feel afraid for the rest of my life. But I fell in love with loving teenagers. I enjoyed spending time with them. Watching them wake up to the love of God made my day. And I secretly believed that if I could help them to see the holy potential in them that some of them could change the world for Jesus, that injustice would dim in comparison to their young ideas and passions. I was hooked but hurting and not sure how to work things out. So, I needed some help staying in it. I went to a youth conference with all of these youth worker people who were convinced that you could make a life of this. I got there by volunteering to stuff conference packets and throw candy at people. I sat in circles with leaders who had not only done youth ministry but they were youth ministry (like they invented it). I did that for six or seven years. It was my continuing eduction. It was nursing my wounds. It was friendship. It was creativity. It was the best thing for me at the time and big reason why I still am a part of a few different ministry and leadership conferences, groups, and tribes. During those times, I met people who saw my gifts and encouraged me to use them. I started using them. I failed a lot. I didn’t communicate well sometimes. I was disorganized. But I kept saying yes—I kept growing–I didn’t back away from the hard things because the hard things were making me better. 14 years later, I can say with confidence, those hard things are making me great. So what I’m saying is this. There are a few things you need to be great at youth ministry, or anything really. It’s not magic or rocket science. It just works–because I’ve learned over time that it does. 6) Welcome hard things. Do hard things for 10 years and you’ll be killer good at what you do. 7) Stay somewhere long enough to see the fruit. 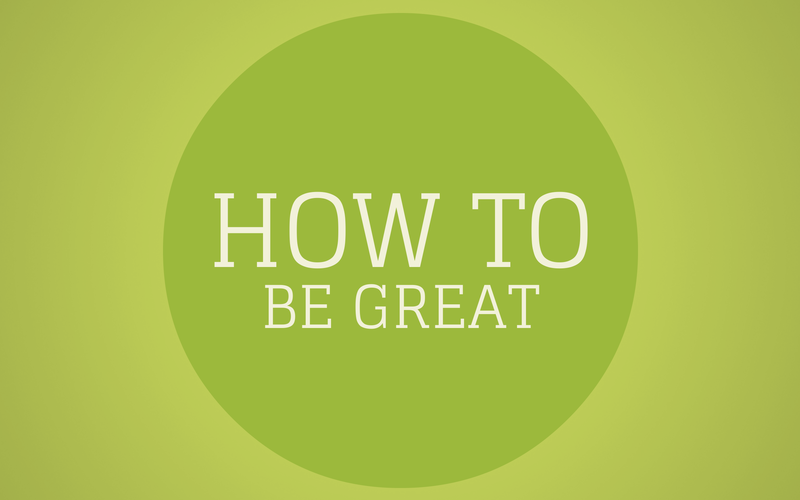 How are you becoming great? What things work for you? Ummm…thanks. lol. I have been doing youth ministry and family life for 25 years now. I was crushed and blind sided by divorce 6 years ago. This is my first full time ministry since the divorce. I have been here three years. Our pastor has had to retire due to Parkinson’s disease so I am under the board’s directive until a new pastor comes along. Remarried with a new baby and suddenly fear has crept in like I am a 19 year old youth pastor again. Several are saying there is no income to keep me and I need to look for a new job. My house is here. My family is here. God has not told me to move. So how do I overcome the hard things at this point? Surprisingly, I have been asked to preach this Sunday. I have had a “hope and future” message prepared for the last month so I am going to try to bless their socks off with the truth of the Kingdom of God. It is hard not to break down and loose my cool but I am reminded of whose I am. And that helps, a lot.